Whether your beard is short or long, odds are, you’ve had issues with flyaway hairs. It’s just a natural part of having a beard. And when you have those flyaways, your face might start to resemble that of a tumbleweed. Less like a hunky lumberjack, and more like a crazy mountain hermit. 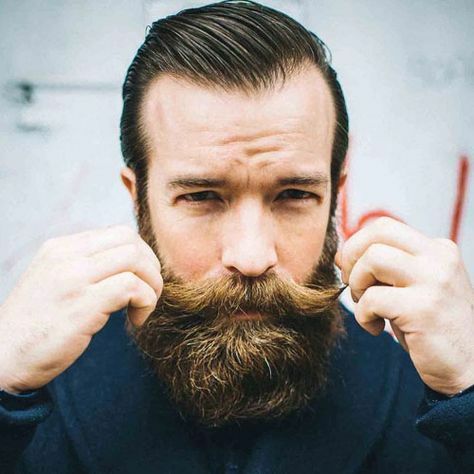 Fortunately for the modern beardsman, there’s an easy solution. Using an all-natural beard balm! The regular use of a beard balm can make a world of difference in not only how your beard looks, but how it feels as well. You might have some questions coming across your mind right now. “What is a beard balm?” “Why should I use it?” “How do I use it?” All these questions will be answered as you read ahead. To put it simply, a beard balm is a solid cream that can be used to shape your beard and condition the hairs and skin. A good beard balm is made up of natural ingredients that are meant to help the hair stay healthy and look great. You want to look for products that contain shea butter, which works as a natural sealant. Avoid fragrance oils at all cost when it comes to beard balms (or any other cosmetic product for that matter). Fragrance oils are synthetic and derive from alcohol, which can damage hair and skin. Applying it to your beard will not only play a role in styling it to flatten down those flyaway hairs, but it will also keep the hair and skin soft. Thanks to the plethora of moisturizing oil that are put into a beard balm, it works as a leave-in conditioner. Plus, many beard balms are made up of essential oils, which help make your beard smell as good as it looks. And for men with thin or patchy beards, beard balms that contain shea butter can make your facial hair look thicker, while improving skin conditions for hair to grow. Using beard balm is incredibly easy. For the best results, use a beard shampoo on the beard when you shower in the morning. After the hair is dry, scrape out a dime sized amount of balm and warm it up by rubbing it between your palms. Then, working from the neck up, run your fingers through your beard. Don’t forget to rub it into the skin as well so that the good stuff can get down to the roots of your hair. After that, run your fingers down your beard from top to bottom to get an even amount of balm on the hairs. Make sure to get the mustache area as well! Using a beard brush or comb will help a lot with distributing the balm. Then, straighten and style your beard as you please. You might need a mustache wax if you want to get a stronger hold for your mustache. Now if you’re already familiar with beard balm, odds are you know what beard oil is. So you know that beard oil functions very similarly to beard balm. They both moisturize the hair and skin. And they both function as a sort of cologne for your beard. The only major difference (other than one being solid and one being liquid) is the shea butter in the balm. The shea butter is what provides the hold that you want from a beard balm. You can use them together if you feel so inclined to give your beard an extra strong smell. Just apply the beard oil before the balm. It’s as simple as that. Hopefully this article has answered any questions you have about beard balms. But if it hasn’t, simply ask us in the comments and we’ll answer it as best as we can. We’ll help you make your beard the best it can.